Now IT Matters is pleased to employ three PepUp Tech Alumni, and support their volunteer activities with Pep UP Tech. This Blog post is written by NiM Associate Consultant Saray Rosales, following a PepUp Tech Bootcamp in New York. PepUp Tech Boot Camp, Monroe College, New York. NiM’s Shakil Kamran (front Row Left) and Saray Rosales (front row third from left, in Blue) are PepUp Tech Alumni, who volunteered at the recent PepUp Tech Bootcamp. As a PepUp Tech Alumni, I had the opportunity to volunteer at a PepUp Tech Bootcamp that took place at the Monroe College located in the Bronx. When I entered the room I could not avoid looking around and see so many diverse faces eager to learn everything about Salesforce and PepUp Tech. It was great to see the classroom full of people from different backgrounds but they all shared one common goal which was the desire to learn more about new technology. The Bootcamp was lead by Devohne Moore, Program Coordinator at PepUp Tech, who did an incredible job leading the session and coming up with activities to break the ice between the students and the volunteers. Another guest volunteers with years of Salesforce experience like Jennifer Lee, Amanda Matczynski, Shakil Kham and Carlos Gallardo shared their knowledge with the students. We all shared our Salesforce journey from how we started in the industry and how we got where we are now. We all wanted to motivate the students and show them that there are no limits to where they want to take their careers. We introduced Trailhead to the students and explained what a great learning tool they have in their hand. The students also created their Trailhead profile and they signed up for their own Developer Free Edition of Salesforce. We were there to answer all their questions and to assist them with the process. Assisting the students reminded me that just a year ago I was in the same shoes as them trying to learn more about Salesforce. One of my main motivations to volunteer with PepUp Tech is that I want to give back to the community and teach others what I have learned so far. PepUp changed my life by introducing me to a world of endless possibilities that the tech industry has to offer. I had an awesome time at the NPSP Day on October 2nd in Washington, DC! It was a nonstop flurry of actions, features, NPSP functions and learning. As always, Ryan Ozimek lead the event in true “Oh Captain my Captain” mode. He started the event and set the tone as an “Unconference” and encouraged everyone in the invitation to bring their learning, their knowledge and their interest to the forefront of the meeting. The meeting started with a general question of “What’s Working?”, “What’s Not Working?” and “What are we not sure about?” as it relates to the Nonprofit Success Pack and Nonprofits using Salesforce. As you can see, we had a fair amount of content from the 70+ people that attended. Some even came as far away as Tennessee to join this NPSP Day (I’m talking about you, David Limiero!). I loved the chance to talk with the nonprofit staff that I regularly hear and work with through consulting: Development Directors, Operations Managers, Gifts Coordinators, Annual Giving Managers and the like. I hear a lot of questions on “How simple can you make it to send acknowledgements?” and “How do we get data from other systems to show in Salesforce? Katie McFadden, one of the sharpest people you’ll ever meet, gave us a review of some of the new features bursting out of the NPSP that were revealed at Dreamforce this year. It was exciting to hear the continual new features and improvements that Salesforce.Org’s team was making to provide better tools for their nonprofit audience. As if that wasn’t enough, the NPSP then kicked off into a series of “Speedgeeking Sessions” where volunteers (ahem, experts) from the audience lead small groups of 4-5 through an app, a feature, a hack or a solution that they used or created to support a nonprofit they knew. This was fascinating - and worth the registration fee for the event right there! I had a front row seat to some of the movers and shakers in the #AwesomeAdmin community and the Power of Us Hub sharing how they help their own Nonprofits become more successful by using Salesforce. My favorite - David Limiero from Stadia showcasing the value of Elements Cloud to organize and scale the processes needed to support and lead a global organization. After the knowledge download, we ran to the nearby Happy Hour to hydrate and celebrate this newfound knowledge. It was an incredible time and I am often reminded of the generous knowledge, caring souls, and super smart individuals that make up the Salesforce Nonprofit community. Thanks to Ryan and Katie for your amazing hosting and leadership of the event. I can’t wait to attend the next one! Justin Barss is the Director of Sales at Now IT Matters. You can follow him on Twitter here. Three times a year, Salesforce releases a whole new set of awesome features and improvements. It's one of the reasons we love this platform and the Winter 19' Release brings some big Lightning improvements, and so much more. Let's jump in to the Winter '19 Release! You can click on any of the green titles to see more details! This is a very welcome addition that makes navigating reports and report folders a breeze. A new take on the core Salesforce UI that many of your users will find more efficient and effective. Feedback is key- Now, when users switch to Classic, you can ask them why! Encourage brief, one-sentence answers. You can do this by customizing the text if you want. Mention this addition to key users in your org so they know it's coming. Consider emailing them or tagging them in a chatter message. Pro-Tip: Once you get feedback, research the feature users were switching to Classic to complete, and communicate with them. Try providing them with a timeline of when SF might enable this in LEX and/or provide potential apps or solutions that would allow them to stay in Lightning. When users provide feedback, they want to know it's being put to good use. And if you don't have a clear solution yet, use it as an opportunity to encourage a stronger dialogue. TL;DR - Don't introduce a new feedback mechanism for users, receive feedback, and then ignore it. That's bad. Now you can isolate the records you need with specific values, right in your search more easily in Lightning. For example, users will be able to find a specific gift amount within a list. Don't lose your text when getting timed out! Nothing's more frustrating than losing your work. No more! Too many list views make it difficult for your users to find the list of records they need. If you've trained users to use List-views (hint: you should), how did it go when you explained they had to wade through the list-views to find the one they need? No more! Joined reports finally make there way (beta) into Lightning! Part of every Admin's toolkit, these powerful tools get some love this release. The beauty of Process Builder is that it allows you to combine multiple operations in a single process, allowing you to eliminate extra components. This makes your life as an Admin easier. In addition, it allows more control; with multiple processes on one object, you can't control which fires first. This new feature reminds you to check before you add, helping you to eliminate what we call “technical debt.” Technical debt is extra baggage in your org that comes from having to put out too many fires. While this feature won't stop you from adding a process (or reduce the number of fires), it might help! Ever have a user go “Back” in one of your flows only to find what they entered disappeared? No more! Note, this requires comfort with Flow and Input and Output variables. No screen-shot here and don't let the short content found in that link fool you! What excites me about this so much is that it opens up another way for you to collect information without turning to a 3rd-party form application. Gaining access to Flow for non-logged-in users has great potential for many uses cases! A small, but welcome formatting addition that makes it easier to for user to drill-down into conversations without losing their place in the overall chat. You have had the ability to customize different components based on the audience with custom criteria, but were restricted by only certain operators. With these enhancements, you'll have a lot more control, with a lot less work. In a Volunteer community, you could have a component regarding an event that shows up only for those within a set of regions (1 or 2 or 3). Ideally, you would just use the “OR” and now you can. In an Affiliate community, you could show a component with an inline form application for a grant or other program, and show it only to those who quality based on data in your Salesforce. While this isn't a great new feature, it is certainly one of the most important parts of Winter '19. Salesforce has always stated that they would keep field history data for up to 18 months, though this was hardly enforced. Starting with Winter '19, this will be enforced. If you have Field History data enabled (from “Field History Tracking” in Setup for each object), and some records contain values that are older than 18 months, you will lose this data. Option 1: Purchase the Field Audit Trail add-on; reach out to your Account Executive to inquire about nonprofit discounts. Option 2: Check out the release notes link above and export your field history data during the grace period which starts when your org receive the Winter '19 Upgrade. Review your org and identify how critical field history after 18 months is to your organization. Consider the Field Audit Trail add-on cost and compare to alternatives such as a consistent archiving policy in an external system for example. Options 3: Do nothing and work within the 18-month limitation. Every organization is different, so while we generally would not recommend this, it will impact some organizations more than others. The price of the add-on may not be worth it for your organization. Do you need to know the value of a field from a year and a half ago? Maybe not. If you aren't sure what to do, try reaching out to the team here at Now IT Matters. We have experience with LDV (large data volume orgs), archiving, and data-retention policies and how they impact nonprofit organizations. While it requires a Salesforce support request, and has some limitations, this is one of the best additions to the admin toolkit in Winter '19. There are too many times to count where I ran into an issue, and wish I could find out where the field in question was used so I could trouble-shoot more efficiently. While there are some workarounds, this fully supported feature is a tremendous time-saver. Pardot users are now fully integrated into Salesforce. No more need for a separate username and password. Login just the same as everyone else and have all users using the same system. This and other releases are for the overall platform and affect all Salesforce users. Your experience with Salesforce will vary, based on your use of specific Salesforce.org solutions. Based on what your organization does (and uses), you get updates and new features to that application, in addition to those directly from Salesforce. For example, the Non Profit Success Pack gets updates nearly every two weeks. Don't forget these! You may find that some key features you rely on are updated more frequently than the tri-annual cycle. Ryan Berens is a Consultant at Now IT Matters. You can follow him on Twitter here. Reilly Ellis recently used these apps for a Now It Matters Client. We will be making use of them now that she introduced them to us. They are either free for non-profits or free with use limits. Super Clone is a pack of three pages that help with cloning, editing, and copying standard or custom objects with their related lists. After playing with Super Clone via their “Test Drive” org, I am impressed with its functionality. I can go to record and choose to clone all or part of it to a different record. In this case, I am pretending that ABC Capital is a foundation that donates to my non profit. The foundation has decided to split into two different entities (as foundations do). Some programs and program officers will be will be moving to NEW ABC Capital and some will stay with ZYX Capital. So, I choose to clone the Organization Account. Then I can choose which records from the Contacts and Opportunities related lists should be assigned to each new account. I can even edit as I go along. I can configure the app to fit my needs, easily deciding which fields users are able to edit and see. I can also control actions for each field. I can imagine several other non-profit use cases for the app which allows users to clone records along with related lists. Salesforce Campaigns are sometimes tediously click-heavy. Two smart apps give users the ability to quickly find and record information so they can get on to the important business of fund-raising. Quickly allow reps to call down a list of Leads and Contacts associated with a particular campaign. Reps can update Campaign Member Status and quickly add an activity to Leads and Contacts without leaving the page. This neat one page app allows users to skip clicking back and forth between Leads and Contacts and campaigns. In this example I am pretending that my Campaign is an annual conference and I’m keeping track of who has responded to invitations. I go to the Campaign Call Down Manager tab. Then I choose my campaign and select by status and/or owner. In this case, I call campaign members who I own and who have responded to our invitation. I can make my notes and change the status of members right on the page. Once I click save, the information is right where I need it. Tired of having to setup Campaign Member Status's every single time you create a new Campaign. Simply setup a list of default status values by Campaign Type and the system automatically assigns. Just as it says on the package, AAkonsult Campaign Status lets you set up a default list of Campaign Member status values for each campaign type and automatically assigns them based on criteria that you configure. You get to skip some steps - really useful for organizations with a lot of campaigns to manage. Once you download the app, you navigate to it via the app launcher. Then choose the Campaign Status Defaults tab. I am pretending that I am setting up a campaign for an annual cocktail party that my organization throws for its press contacts each year. It’s a Public Relations type and I have four possible Campaign Member Statuses set up: Invited (this is my default), Responded Yes, Cancelled, and Attended. I set these up in my Campaign Member picklist. Now I’m ready to begin using the Campaign Status Default App. I navigate to the app and go to the Campaign Status Defaults tab. Choose the Campaign Type for which you want to set your default. Make it active and choose add/update. In the related list choose new to add a default value. Enter the sequence. In this case, I chose “1” as I want the default set to the first interaction I have with my Campaign Members. Then choose the status you want to set as the default. (I previously set up “Invited” as a possible choice in my Campaign Member Status picklist.) Finally tick the “Default” checkbox. Then I add my Campaign Members. My default choice is available to me. And I can check to see that all the information is correct. The Campaign Status Default app helps us avoid clicks and get back to the important task of planning the party for our press contacts. Jenifer Alonzo is a Certified Salesforce Administrator and Consultant at Now IT Matters. Great leaders lead with heart. Great leaders prioritize connection and relationship with people, regardless of their level or status, because they believe that everyone has something to teach. Great leaders take time to mentor others. Great leaders prioritize their own health and well-being. Great leaders create a culture where failure is treated as a learning experience. Great leaders admit when they need to pull back and regroup. I’ve been to the main event, Dreamforce, in San Francisco, when I lived there - and this is Bozeman’s inaugural event. This is a great opportunity for Bozeman and is perfect for anyone living in Montana. This city has a surprising amount of tech companies and workers. Not many people outside of Montana know this, so it’s a great way for Bozeman to get on the Salesforce and tech maps and let people know that we are here. Two speeches stood out to me at Big Sky Dreamin’: One was done by one of our clients, The Commit Foundation, which is a veterans organization that helps new veterans transition to new careers after their Military service. Brian Rauch, the Data Analytics Manager, was highlighting the work they do - and one statistic particularly stood out - He was speaking about the suicide rates of military members and how they dramatically rise once they return home and begin to integrate with normal society. It’s actually more dangerous for veterans after they come home, so they need a place to transition back into society more seamlessly. Salesforce also has a program called VetForce which trains military members in Admin skills and other Salesforce certifications. The other presenter was Sandi Nuss Zellner -- she was originally a very active person and music teacher. Then she was diagnosed with a Chiari malformation and had to have brain surgery. She was unable to return to teaching music, because the cacophony of the instruments become physically painful for her. She was also unable to continue her active lifestyle. The loss of so much in her life was so emotionally painful that, after becoming a brain surgery survivor, she then became a suicide survivor. After surviving the suicide attempt, she discovered Salesforce, and working through hundreds of Trailheads gave her a new focus in life. Shortly after starting to learn Salesforce, she attended Dreamforce and found the Ohana which gave her a new community. NPSP day, organized by Ryan Ozimek, was also held in Bozeman. NPSP days allow nonprofits to come together to network, sharpen their Salesforce skills, and find out how other nonprofits are using Salesforce. Just a couple of the nonprofits with multiple staff members at the NPSP day, were Montana Conservation Corps and Hopa Mountain. MCC is teaching their young staff how to use Salesforce and they created an internal group to meet, discuss and build their skills. Hopa Mountain works primarily with rural and tribal citizen leaders (both adult and youth) who are improving education, ecological health and economic development. The NPSP day was hosted by Thrive, (and they also loan their space for the Bozeman nonprofit user groups.) Thrive focuses on working with families and children: They partner with local schools and the liasons at the schools will pair volunteers with a child to mentor. Looking forward to 2019, I would love to see these two events come together in one week. The ability to connect the NPSP group with attendees of Big Sky Dreamin’ would be fantastic, and people would be able to plan a trip to Bozeman to attend both events. I recently took my 10 year old to WITness Success. Ready to fly to Denver! My little one, her fast friend, and their swag. A few days after we returned home, I asked my daughter what she learned from attending WITness Success with me. I expected her to say something akin to "Well, dearest mother, I learned foundations for building a career in tech. By the time I am 12 years of age, I plan to have two Salesforce certifications and have built an app." She likes when the plane takes off much better than when it lands. She liked all the stickers and her Equality hoodie. She liked hearing me present ("You were so professional!"). She liked meeting my friends, especially my friend with the cool glasses. Maybe my expectations were just a little unrealistic for a 10 year old. So why does it matter? Why did I fly my daughter to Denver? Generally, her context of professional women has been that women are singers or dancers, nurses, or teachers. She knows that I work for Now IT Matters and I am a Salesforce consultant. She's told me many times she's going to work for Salesforce when she grows up. A common household imaginative role play is "Let's play Now IT Matters" which consists of her and her brother pulling out their computers and pretending to talk to clients. I work from home and she sees me on the phone and computer all day, but doesn't really know what I do. 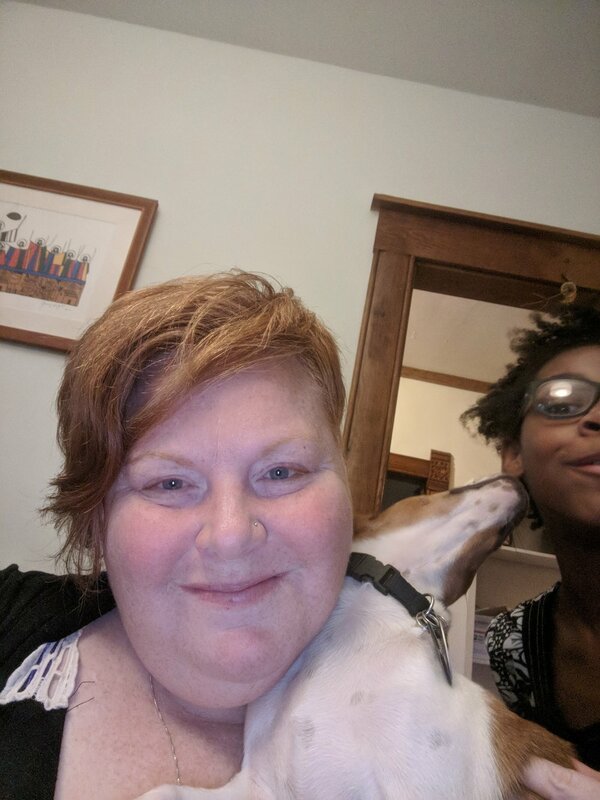 A recent video call in which I was photobombed by both my daughter and the puppy. I wanted her to gain a broader context. I wanted her to see HUNDREDS of successful women in tech. I wanted her to see women who looked like her claiming their space in the Salesforce ecosystem -- Leah McGowen-Hare and Leandria Streeter -- and ROCKING IT. When we discussed this fact, that my goal in bringing her on the trip was broadening context, she looked at me as if to say, as a 10 year old often does, "Duh, Mom!" and said "Yes! That was really cool. There were a lot of women there! They were all really nice and made me feel welcomed." She didn't need to talk about it much more, but I realized right then that what mattered was the welcome. Being there in the room, running around with her new friend Z, collecting dozens of pairs of socks, all helped her to feel she belonged. I think welcoming is the thing that the Salesforce #Ohana does best. In a world that is deeply divided, the art of hospitality and making room for a welcome matters significantly. Making space for others to be themselves and belong is a gift. Being welcomed by the amazing WITness Success #Ohana helped my little one envision a future where she is a successful woman in tech. And since we've been home she's been begging to "do Salesforce" -- she loves Trailhead and we have a plan to run a BAM! event in the future. Thank you, WITness Success, for a beautiful event and for welcoming little O. It has been an amazing summer with a whirlwind of community events. I had the pleasure and privilege of attending a few Salesforce community led events. I love these events because they are designed to be more intimate and accessible. They provide the Salesforce community an alternative to the larger Salesforce events such as Dreamforce and TrailheadX. Community events provide the same content, knowledge share and networking that you would find at the larger events -- but at a reduced rate, so that everyone interested can attend. I call these community events “Chicken Soup for the Soul” -- they help me recharge and reinvigorate my energy. This is always one of my favorites. They say everything is bigger in Texas and I would agree. The community love that I felt while I was in Texas was HUGE! The leaders of the group describe this event as a “Texas-sized Ohana community led conference that provides knowledge + inspiration while celebrating anyone who uses Salesforce.” One of my favorite TXD18 moments was the keynote given by Salesforce’s Chief Equality Officer Tony Prophet. Tony highlighted how Salesforce is championing equality for all, and also detailed how the community in Texas is blazing the equality trail. A local example is Vetforce. Vetforce is a Salesforce job training and career accelerator program for military service members, veterans and spouses. More information about that can be found here. Toya Gatewood and I gave a presentation entitled “The Power of One”. We had great attendance and received amazing feedback. It was truly a great time engaging with the community in a meaningful way. I was show so much love in Texas by so many people but I have to give a special shout out to Joni and Jace Bryan, Stephanie Herrera and Holly Firestone! I am originally from the Midwest and this was the very first community event I ever attended, beginning in 2014. This is one of my top events to go to every year and I even volunteer for this event. Midwest Dreamin' is one of the first organized community events and is lead by some amazing people. Each year I can see the growth and success, and as a matter of fact I can recall something significant happening to me or someone I know. I met Toya Gatewood for the very first time at this event and she is one of my very best friends today. I have presented a number of times at this event and have also learned more than I can ever repay back to the community from this event. This year I got to meet some of my Now IT Matters team members at this event. We are a remote consulting company so this is how we get to see each other. The keynote given by Salesforce’s Chief Product Manager Brett Taylor was phenomenal. Midwest Dreamin’ will always hold a very special place in my heart because of all of this! The keynote was given by Salesforce’s VP for Strategic Research, Peter Coffee. He was so on point, (one speaker I had never seen before) and my favorite quote from his presentation was “New solutions require wildly different perspectives.” The closing keynote by Zayne Turner was informative and insightful. She highlighted the fact that you need ‘Joy’ when building solutions. Sandi Zellner left no one with a dry eye in the room when she told her personal Salesforce journey. She was brave and inspiring! This event was small but mighty and I can see the greatness that is to come for next year’s event. The beauty of these community events is that everyone is welcome. You can feel the love flowing through every session, every speaker and all the hard work that it takes to put on these events. If you have the opportunity to a community event don't pass it up! Trust me, you will not regret it! So thank you to all the community teams who work tirelessly to entertain, educate and delight us. You are the REAL MVP’s!!! Join my colleagues and I at Dreamforce in San Francisco, on September 25-28, 2018. We hope to see you there! The most important thing to remember about design is that you are not your users. The design principles that I previously covered will help you set the groundwork for a usable system, but the best way to see if your system is usable is to test your users using it. Remember the law of familiarity. Admins are in Salesforce all the time. What makes sense to you may because of your history with the platform may not make sense to someone who is just in Salesforce to enter program data. The is doubly true when you’re doing a redesign or introducing a new feature. You’ve developed familiarity with your design through the time that you spent creating it. It can be hard for you to tell if something makes sense because of its design or because you’ve developed a learned association. You’ve probably does user tests in your system before, but it’s likely those were user acceptance tests. User acceptance testing checks to see if your systems working correctly, for instance, does the “Total Payments” rollup accurately calculate all the payments? Usability testing checks if your users are using your system correctly. For instance, do they know what the “Total Payments” field is? Do they use it like you want them to use it? Survey a range of users - new users, super users, and users who still struggle. Their narration will give you insight into your design. What parts do they understand? What parts are they missing? This may be the hardest part of user testing - but it’s important for you to stay silent. You won’t always be there to guide them when they’re using Salesforce. This is your chance to dig in to the actions you observed and get more feedback on the design. Make the necessary changes, find more users, and repeat! Not everything is perfectly intuitive the first time around. You can test “learnability” by asking the same user to complete the same task multiple times. If they get it after a couple tries, great! If they still need help weeks later, you should reassess your design. If you or your users don’t have time for dedicated usability testing - wrap it in with training. When your users ask you how to complete as task, have them show you how they do it first before you show them. This will give you some quick insight to the usability of your design.